Reddit is now being funded by a multi-billion dollar Chinese company known for aggressively silencing dissidents in China. Reddit, once known as being the platform for free speech, is currently fundraising to keep itself a float, with a $300 million goal, according to NewsBusters. Half of that goal has already been met, thanks to a massive investment of $150 million from Chinese censorship company Tencent. The company is in charge of blocking, blacklisting and preventing internet access to certain groups, sites, and information in China. 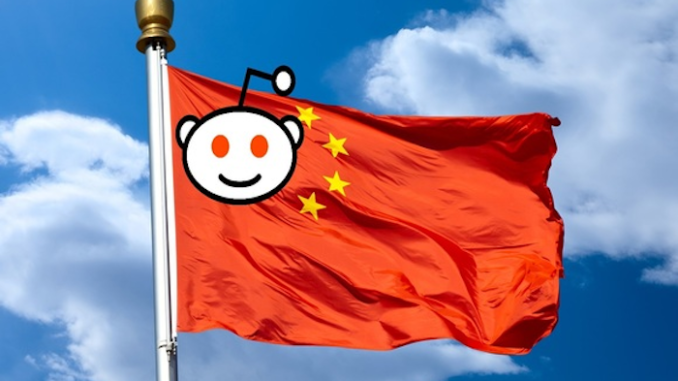 Ironically, Tencent is responsible for the banning of Reddit in China. Information Liberation reports: Probably a good decision on their part. […]Tencent is now “literally reinventing censorship in China,” according to Gizmodo. The company works closely with the Chinese government to ensure that the standards for censorship are met. No doubt they’ll be sharing their censorship techniques with one another!